James Gillray (1757 – 1815) was a British caricaturist and printmaker famous for his political and social satires, mainly published between 1792 and 1810. His caricatures are almost all in etching, some also with aquatint, and a few using stipple technique. I find the images themselves very powerful in their use of tragi-comedy and exaggeration. But the etching/aquatint style itself I find too elaborate. James Gillray website Website launched in June 2015 on the 200th anniversary of Gillray’s death as a celebration of his life and works. It includes a chronological catalogue of Gillray’s known prints, a list of major museums and archives where his work can be seen, information about him and his working methods and techniques, and links to short biographical sketches of some of the people he caricatured. Edited from material on his website and Wikipedia, inserting You Tube videos. I have left in the links to more detailed discussion of his work for future reference. His sketches are real works of art. The ideas embodied in some of them are sublime and poetically magnificent in their intensity of meaning, while the forthrightness—which some have called coarseness—which others display is characteristic of the general freedom of treatment common in all intellectual departments in the 18th century. The political caricatures comprise an important and invaluable component of the history extant of the latter part of the reign of George III. They were circulated not only in Britain but also throughout Europe, and exerted a powerful influence both in Britain and abroad. George III, George’s wife Queen Charlotte, the Prince of Wales (later Prince Regent, then King George IV), Fox, Pitt the Younger, Burke and Napoleon Bonaparte are the most prominent figures. In 1788 appeared two fine caricatures by Gillray. Blood on Thunder fording the Red Sea represents Lord Thurlow carrying Warren Hastings through a sea of gore: Hastings looks very comfortable, and is carrying two large bags of money. Market-Day pictures the ministerialists of the time as cattle for sale. He was not a keen political adherent of either the Whig or the Tory party. His caricatures satirized members of all sides of the political spectrum. George III: A number of his most trenchant satires are directed against George III, who, after examining some of Gillray’s sketches, said “I don’t understand these caricatures.” Gillray revenged himself for this utterance by his caricature entitled, A Connoisseur Examining a Cooper, which he is doing by means of a candle on a “save-all”; so that the sketch satirises at once the king’s pretensions to knowledge of art and his miserly habits. Gillray could also be incredibly subtle, and puncture vanity with a remarkably deft approach. 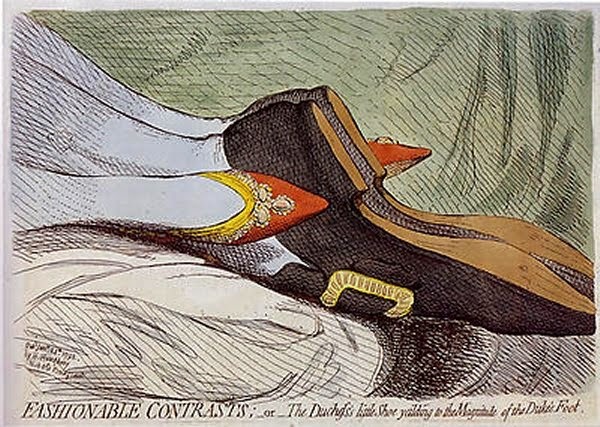 The outstanding example of this is his print Fashionable Contrasts;—or—The Duchess’s little Shoe yeilding [sic] to the Magnitude of the Duke’s Foot. This was a devastating image aimed at the ridiculous sycophancy directed by the press towards Frederica Charlotte Ulrica, Duchess of York, and the supposed daintiness of her feet. The print showed only the feet and ankles of the Duke and Duchess of York, in an obviously copulatory position, with the Duke’s feet enlarged and the Duchess’s feet drawn very small. This print silenced forever the sycophancy of the press regarding the union of the Duke and Duchess. Among Gillray’s best satires on George III are: Farmer George and his Wife, two companion plates, in one of which the king is toasting muffins for breakfast, and in the other the queen is frying sprats; The Anti-Saccharites, where the royal pair propose to dispense with sugar, to the great horror of the family; A Connoisseur Examining a Cooper; the paired plates A Voluptuary under the Horrors of Digestion and Temperance enjoying a Frugal Meal, satirising the excesses of the Prince Regent (later George IV of the United Kingdom) and the miserliness of his father, George III of the United Kingdom respectively; Royal Affability; A Lesson in Apple Dumplings; and The Pigs Possessed. The Loss of the Faro Bank, Lady Buckinghamshire is told by her cowed husband that a theft of money has taken place; Charles James Fox (1749–1806), a prominent Whig politician of the time, is seated at the card table hoping not to be found out.The enduring quality of this piece lies in the visual metaphors and symbolism Gillray has used: the locks on the door and the visual contrast between the opulence and gambling inside and the panic-stricken husband outside. But it’s the people on the inside that have caused the problem, not those locked out. 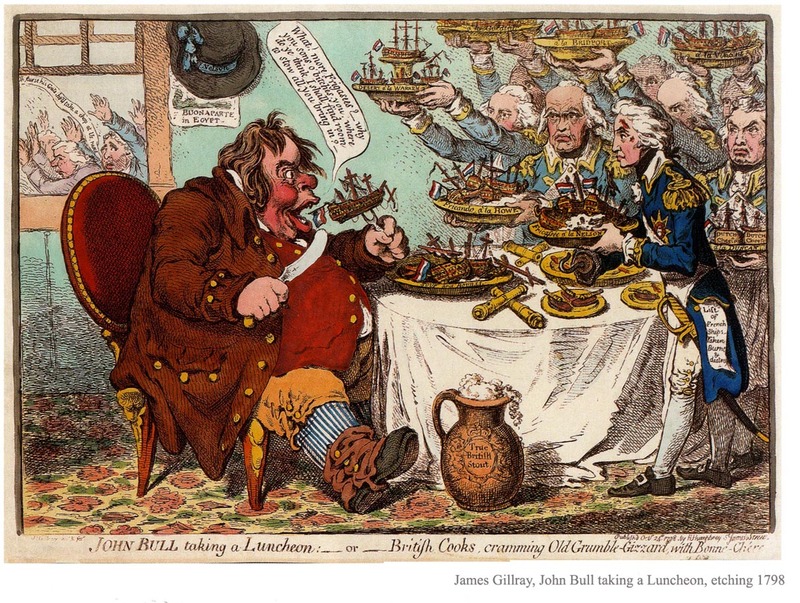 French Revolution Gillray took a conservative stance; and he issued caricature after caricature ridiculing the French and Napoleon (usually using Jacobin), and glorifying John Bull. A number of these were published in the Anti-Jacobin Review. Other famous works include: The Bridal Night; The Apotheosis of Hoche, which concentrates the excesses of the French Revolution in one view; The Nursery with Britannia reposing in Peace; The First Kiss these Ten Years (1803), another satire on the peace, which is said to have greatly amused Napoleon; The Hand-Writing upon the Wall; The Confederated Coalition, a swipe at the coalition which superseded the Addington ministry; Uncorking Old Sherry; Making Decent; Comforts of a Bed of Roses; View of the Hustings in Covent Garden; Phaethon Alarmed; and Pandora opening her Box. The miscellaneous series of caricatures, although they have scarcely the historical importance of the political series, are more readily intelligible, and are even more amusing. Among the finest are: Shakespeare Sacrificed; Flemish Characters (two plates); Two-Penny Whist (which features an image of Hannah Humphrey); Oh that this too solid flesh would melt; Sandwich-Carrots; The Gout; Comfort to the Corns; Begone Dull Care; The Cow-Pock, which gives humorous expression to the popular dread of vaccination; Dilletanti Theatricals; and Harmony before Matrimony and Matrimonial Harmonics—two exceedingly good sketches in violent contrast to each other. Gillray’s eyesight began to fail in 1806. He began wearing spectacles but they were unsatisfactory. Unable to work to his previous high standards, James Gillray became depressed and started drinking heavily. He produced his last print in September 1809. As a result of his heavy drinking Gillray suffered from gout throughout his later life. His last work, from a design by Bunbury, is entitled Interior of a Barber’s Shop in Assize Time, and is dated 1811. While he was engaged on it he became mad, although he had occasional intervals of sanity, which he employed on his last work. The approach of madness may have been hastened by his intemperate habits. In July 1811 Gillray attempted to kill himself by throwing himself out of an attic window above Humphrey’s shop in St James’s Street. Gillray lapsed into insanity and was looked after by Hannah Humphrey until his death on 1 June 1815 in London; he was buried in St James’s churchyard, Piccadilly.